For ME Awareness Month 2014 Tanya's two youngest daughters Tasha (15) and Tara (14) decided to make a video to try and explain to none sufferers what it is like to live with this illness. It took them some time to decide how to film it, they wanted to do something that didn't come over as self-pitying or frivolous. They wanted to make an impact and to raise awareness and the very urgent need for funding towards biomedical research. Together they came up with the concept of standing in front of a blank wall and silently hold up signs to convey their message. They asked Sarah Louise "Feather" Jordan for permission to use her song to play throughout their video as they filmed themselves holding up the signs. We feel the song compliments the girls vision of their video perfectly. Both girls suffer moderate/severe M.E. which means they spend most of their days housebound, they have to plan how to use their energy as they have so little and the rare trips out have to be carefully orchestrated so not to make them too ill.
To make the video the girls spent hours with sheets of A4 paper and black sharpie pens creating the signs to hold up. This process took many hours and ended up with the whole family getting involved. This was because it took an awful lot of energy for the girls to do just one sheet as each word had to be coloured in to make it bold enough to be visible on the screen. This is the finished product, which we hope you enjoy. Please feel free to share this video far and wide and help us to spread the message that M.E. is a severe, chronic, debilitating illness that affects so many of our population. Together we can make a difference! These lyrics were then set to music by Dave Freer and Peter Allan Singer. The song can be purchase from any of the links below and all proceeds go to Invest in ME Research. 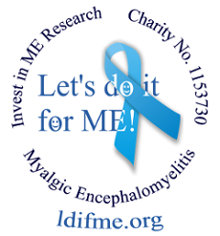 Say Happy Anniversary with M.E Awareness! Let's get in gear for ME Awareness!